The state on Monday dropped the breach of peace case against Lucian Wintrich, a White House correspondent for conservative website Gateway Pundit, in connection with a tussle at a speech he was to deliver at UConn last month. 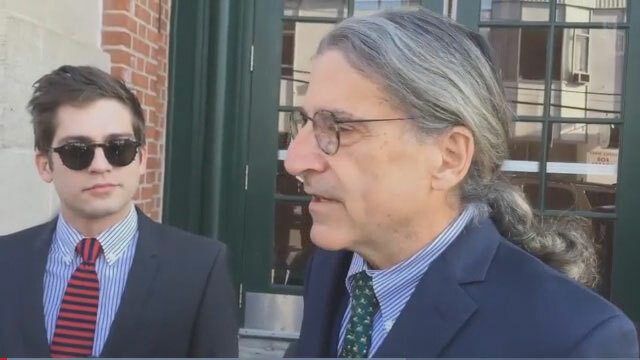 Wintrich was at Superior Court in Rockville, but did not appear before a judge. His lawyer, Norm Pattis, met with Tolland State’s Attorney Matthew Gedansky. Later, Pattis said the state recognized Wintrich was retrieving notes that were stolen from him when the incident happened. Wintrich faced a misdemeanor count of breach of the peace. The incident started when Quinebaug Valley Community College adviser Catherine Gregory took a copy of Wintrich’s speech from the lectern where he was giving a talk titled, “It Is OK To Be White.” Wintrich grabbed Gregory to retrieve his speech and was arrested. Police said Wintrich grabbed a woman, “pulling her back in a violent manner,” and caused a significant disruption to the event with his “tumultuous behavior.” Gregory was charged over the weekend with Disorderly Conduct and Criminal Attempt to Commit Larceny in the 6th degree. She is scheduled to appear in court Wednesday. Pattis said Wintrich has “nothing to regret” about the incident. Pattis said he and his client will be “asking the court to impose some brief period of incarceration” in the case against Gregory. Gedansky said he considered the facts and the law and concluded a nolle was the appropriate resolution of the case. “The state’s analysis of the facts and the law make me conclude that the police acted entirely reasonably and Mr. Wintrich through counsel has acknowledged that,” he said. Shortly after the incident, a window was broken in the hallway where Wintrich was being held. Sean Miller, 19, of Glastonbury and a UConn student, was charged with breach of peace and criminal mischief. Miller was also scheduled to appear in court Monday. As part of the fallout, UConn President Susan Herbst announced new rules for students events, including reviewing the backgrounds of speakers, requesting guest lists and planning for potential disruptions and counter-protests. The policy, which is being prepared for the spring semester, will not apply to the kind of impromptu protests that are frequent on campus, such as the student-organized March for Action held in reaction to Wintrich’s speech and the university’s response, says Elly Daugherty, dean of students. The vetting process would apply only to student groups reserving space, equipment or security resources on campus. And while officials say the policy does not set a precedent for banning community members or students based on criminal record, they also say they would have banned one attendee, had he appeared on a guest list. After the event, the university learned that the man who stood near Wintrich, Salvatore Cipolla, attended the Unite the Right rally at the University of Virginia in August and was arrested at a far-right march in Boston in May. Cipolla was charged with criminal mischief after an altercation with a reporter at New York University in February, according to police. In an interview with The Courant, he acknowledged that incident — “I shoved a journalist, big deal,” he said — and that his social media posts are fraught with violence, racism, misogyny, homophobia and anti-semitism, though he said his words online should not be taken seriously. Cipolla is a former member of a pro-West men-only organization, the Proud Boys, and admitted he’s “not a big fan of the gays” and “not bananas about the Jews.” Still, Cipolla said he didn’t understand why he should be banned from attending an event like Wintrich’s, which the sponsoring group, UConn College Republicans, opened to the public. He would not have been screened under UConn’s new rules because Wintrich did not invite him, both men said. Rather, Cipolla came unannounced and decided to talk with and film Wintrich, with whom he’d attended similar events and appeared on a conservative talk show. Wintrich said that he disagrees with Cipolla’s ideologies, which he called dubious, but that the university’s response troubled as well.